Take Advantage of Our Half Price Sale!! Purchase Liquid Story Binder XE for only $22.98!! 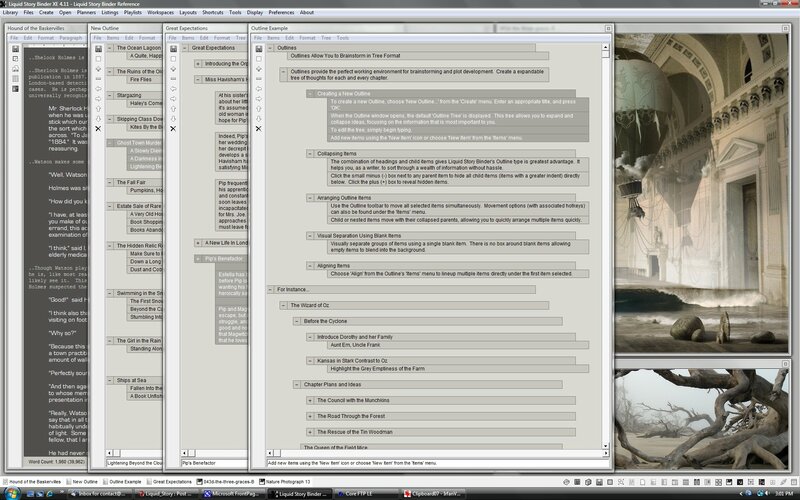 Create Dossiers for major characters and settings. 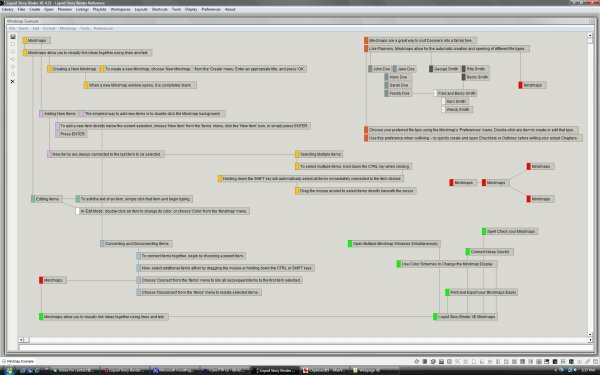 Plot your novel by organizing cards along colored timelines. Create a writing journal, or even fictional journals for each one of your characters. 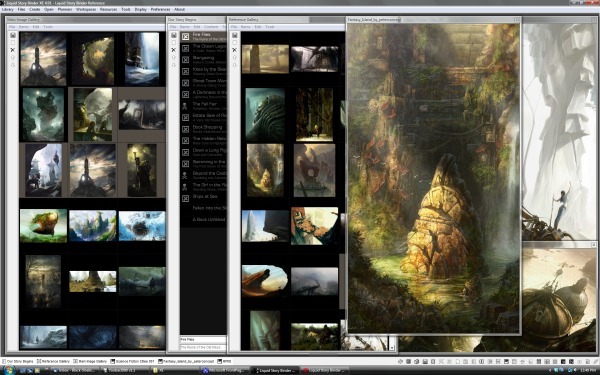 Organize your reference images into galleries. A list of titles and captions with checkmarks. A two-columned list for direct comparisons. 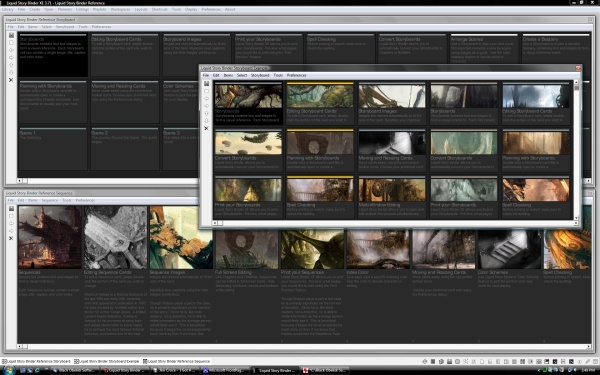 Organize complex scenes using titles, descriptions, and color indexing. Liquid Story Binder XE remembers just where you left off. Combine multiple chapters into a single manuscript automatically. Preserve your font and paragraph editing with Format Printing. Preserve your favorite window layouts for quick access. Words per day, words left to write, days remaining, multi-document word counts. Create the perfect writing environment with your favorite window colors. Record yourself reading your own novel. Test for pacing and time. Organize all your files into easy-access file trees. Every Chapter has its own backup repository. Never lose a single word with automatic version and session backups. Compress your whole archive into a single ZIP file. Quickly access your favorite external software and documents. Times, Word Counts, Goals, Sessions, Versions, Days. 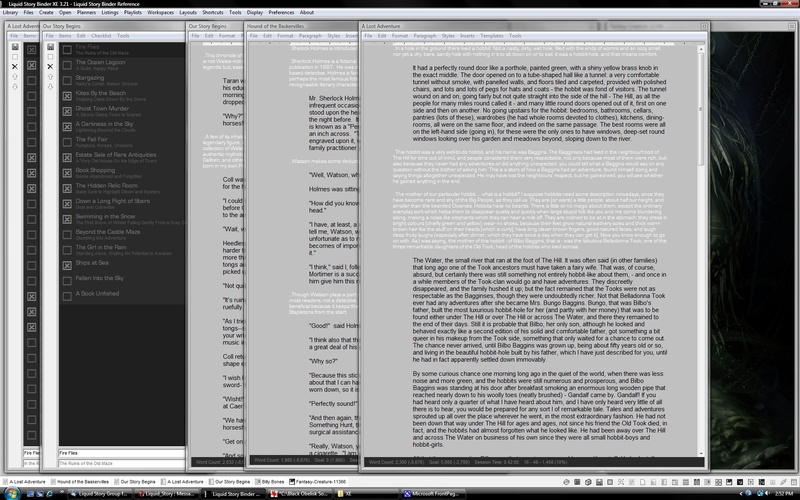 Read over your work in a easy to view columned window, free of editing distractions. Add your MP3s and sort them into playlists. Set the mood for writing. Open your work outside of Liquid Story Binder. Momentum Writer is the ultimate tool for distraction-free writing. 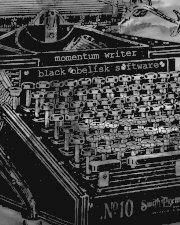 Momentum Writer is a typewriter for your PC. Liquid Story Binder XE is specifically designed for fiction writing. XE includes all the standard features such as spell-checking, thesaurus, smart quotes, templates, font and paragraph styles -- everything you need to write your next great novel. Pick and choose the file types that work best for you. Liquid Story Binder never tells you how to write! Flexible file types allow you to use your imagination. 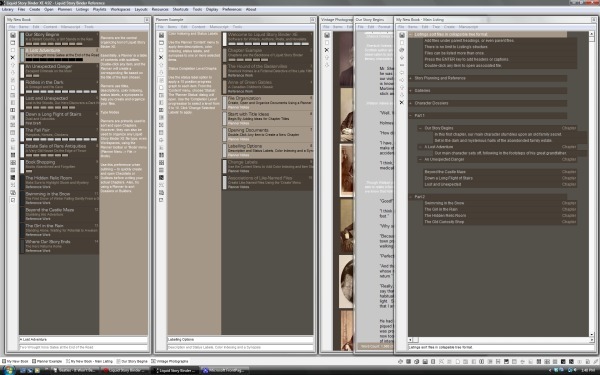 Use a Dossier for characters, places or things, or a Builder to preserve important snippets. Create a Binder folder and let Liquid Story Binder sort, search and combine your documents. Choose a color scheme that suits your writing style. Save window positions and open files for quick and easy access using Workspaces. 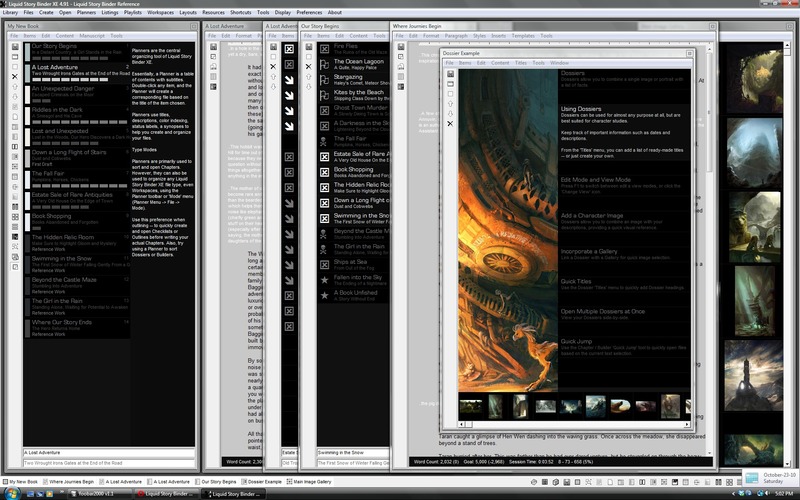 Open dozens of windows simultaneously - or just a simple textbox centered in the screen. Even though Liquid Story Binder is packed with features, sometimes less is more. 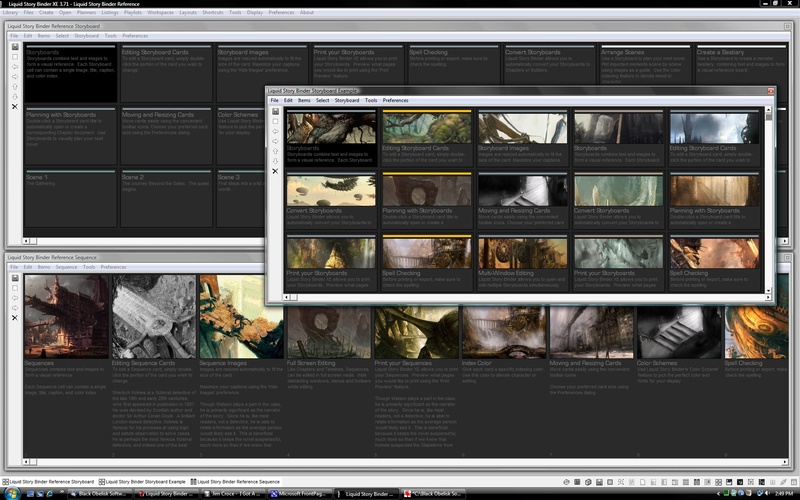 Liquid Story Binder XE offers full screen editing, a feature that removes all distractions including menus and title bars. deleting, or revisions. The Typewriter tool doesn’t even allow you to use the backspace key. It forces you to write, to move forward, to add new words. It halts the temptation to linger, revise, and correct. Turn Liquid Story Binder into a typewriter for your PC. Liquid Story Binder XE Mindmaps allow you to visually link ideas together using lines and text. A mindmap is a diagram used to represent words, ideas, tasks, or other items linked to and arranged around a central key word or idea. Unlike many mindmapping applications, Liquid Story Binder XE does not use a rigid or pre-designed structure. Users can place items however they choose. Create item colonies, isolated from one another. Index items by color. Change item connections quickly and easily. Try using Mindmaps to create and organize family trees. For every Chapter, Liquid Story Binder XE creates a single, easy-to-access backup file. This backup file contains an entry for each day's changes. Liquid Story Binder XE also includes a complete Binder backup using ZIP compression. Black Obelisk Software recommends Dropbox for all your online backup and synchronization needs. Liquid Story Binder can be installed on a flash card or USB drive. Take your writing wherever you need to go. Use XE on a friend's computer, at school, or at work. 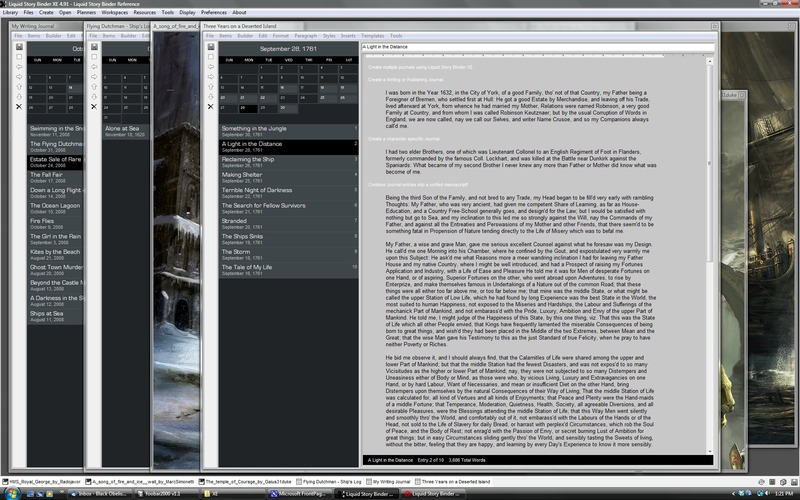 Liquid Story Binder integrates with WordWeb. WordWeb is a quick and powerful international English thesaurus and dictionary for Windows. It can be used to look up words from almost any Windows program, showing definitions, synonyms and related words. There are also many proper nouns and usage examples. Liquid Story Binder XE can search every Chapter, Note, Builder, Timeline, Storyboard, Outline, Dossier, Sequence and Backup for a single lost word or phrase. 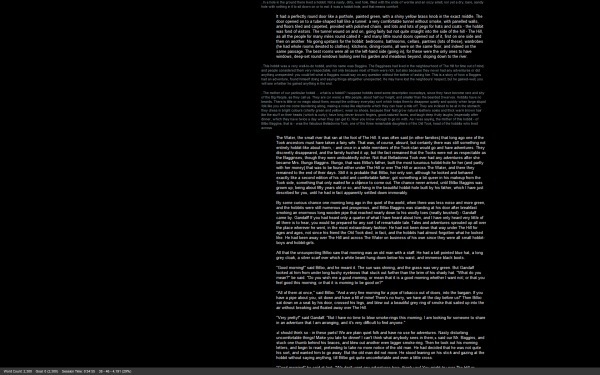 Can't remember where you wrote that important paragraph? Just use XE's Universal Search. Liquid Story Binder XE uses basic TXT, RTF, and ZIP file formats guaranteeing future access no matter what software you use. The Liquid Story Binder XE installation package is only 7MB in size! Liquid Story Binder is Windows 10 compatible. Liquid Story Binder XE is also compatible with Windows 8, 7, Windows XP and Vista. 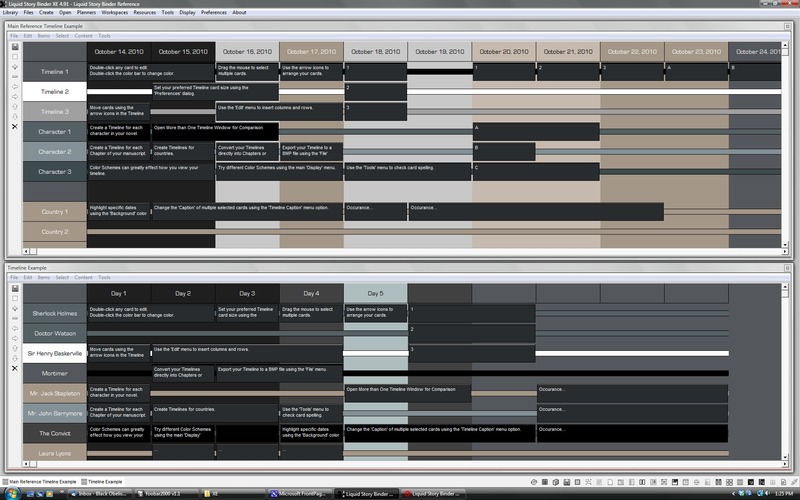 Download Liquid Story Binder XE and test out it features before buying. The download includes the entire XE package without limitations. If you love what you see, return to our website a buy a special licensing code that will allow you to use Liquid Story Binder indefinitely. After that, all future upgrades and updates are absolutely free! 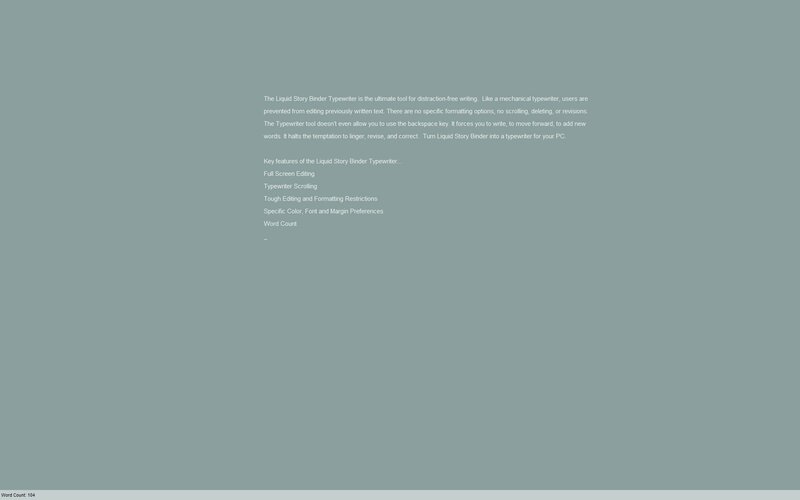 Liquid Story Binder XE, for all its included features, has an incredibly small download. At 7MB, the XE installer is the size of a MP3 file and will download in mere minutes. Once the download has completed, feel free to install Liquid Story Binder XE anywhere, even on a USB thumb drive, flash card, or Windows connected IPOD! Take your writing everywhere! 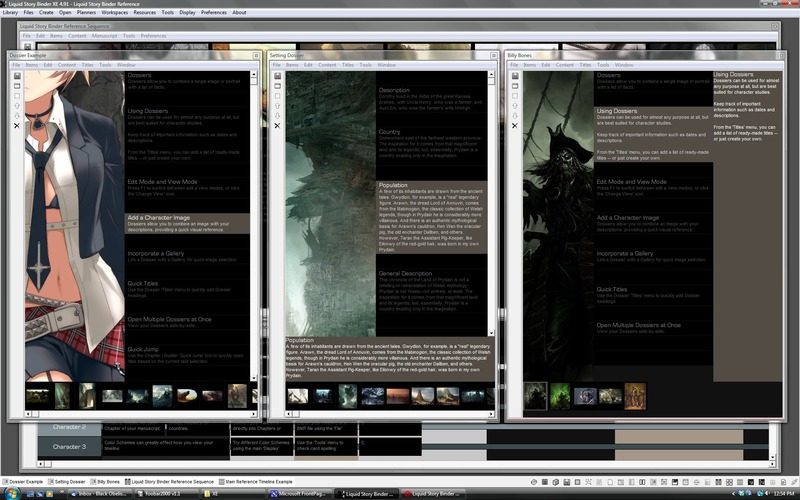 Liquid Story Binder is designed to run on systems using Windows XP, Windows Vista, and Windows 7. The setup file is approximately 7MB in size and should take only a matter of minutes to download. Liquid Story Binder is a shareware product. You can download it absolutely free, with no restrictions or limitations. It is completely functional with all available features included within the download. Yet, after a period of 30 non-consecutive days of use, Liquid Story Binder will cease to work. When this occurs, you may decide to uninstall Liquid Story Binder, or purchase a special registration code that will allow you to keep using Liquid Story Binder indefinitely. There is no obligation for you to buy, just test out the software to see if it fits your specific needs. If you like what you see, return to our website and purchase your $45.95 registration key. The code will be sent to you by email.